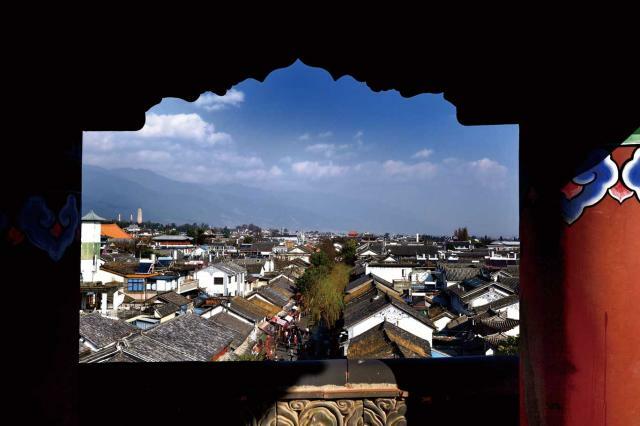 It’s often said that the ancient walled city of Dali in Southwest China is a better place to live than visit, but the new influx of people has transformed this ancient walled city. Ten years ago, it was a laid back backpackers’ paradise, blessed with year-round good weather, and nestled between the Cang mountain range and the vast Erhai Lake. Amid the free and easy attitude, local Bai minority women openly sold the bounty of the local hemp plants that grew wild everywhere. Prices were dirt cheap, and foreigners had a rare glimpse into China’s past with the crumbling, unrestored cobblestone streets and ancient walls. These days, many of the old buildings, especially on the main tourist streets, have been “restored” or replaced with modern buildings. The hemp plants have been cut down, and the Chinese and foreign hippies busking and selling hand crafted goods along Renmin Street have been pushed out. To many who pass through, Dali will seem like another victim of its own success – the local government has to some extent killed the goose that laid the golden eggs by turning the ancient city into an overrun, modern tourist hub, much like Lijiang two hours north. Much like California in the 1950s and 60s, Chinese discontented with the high-stress rat race of big city life are relocating in Dali, seeking clean air, beauty, a balanced lifestyle and spiritual fulfillment. This chilled-out, spiritual side of the city is worth a visit. Here are some tips on seeing this side of Dali. There are more than 20 bars in the main tourist area featuring men and women with guitars singing sentimental pop favorites. These interchangeable musicians usually sing for an hour and move on to another bar. However, Dali punches above its weight class in terms of talented musicians performing original music. A decade ago, members of the seminal Beijing folk band The Wild Children moved to Dali, laying the foundation for a thriving music scene heavily influenced by Chinese folk traditions. Venues including September, Jielu, Jim’s, Ba-Ba Bar and the Peace Hotel regularly feature high quality performances of original music on par with what you might find in Beijing or Shanghai. There are also frequent small festivals or one-off performances – you need to ask around. The local government has converted a former bed sheet factory into a creative zone, which has become an excellent place to feel the local bohemian vibe. It features antique shops, art exhibits, and most importantly to a tourist, two outstanding bookstores where you can sip a cup of coffee and people watch. The complex also hosts the office of Wild China, which organizes free local bird watching trips. In addition, there is a climbing wall run by a local rock climbing guide service. 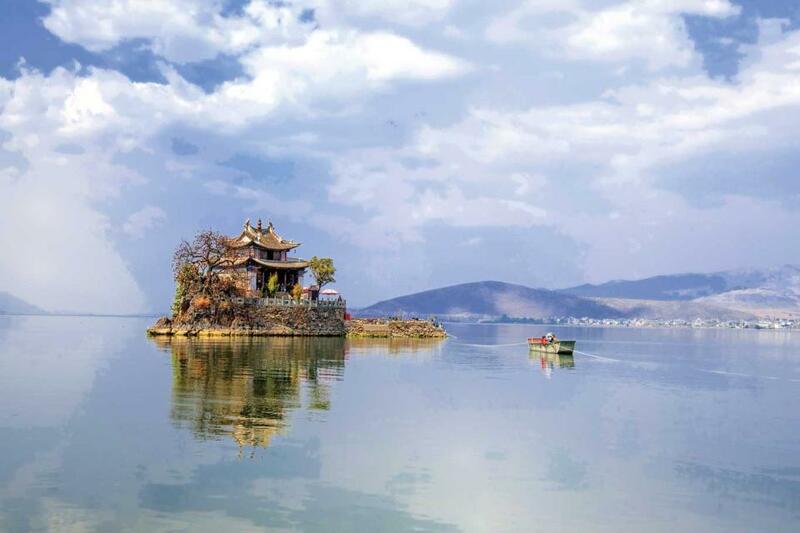 Swimming and boating are banned in Erhai Lake, a landmark featured in a number of famous Chinese folk songs and movies. However, there is a ring road around the lake that is lovely for a day trip on an easy-to-rent electric scooter, or an overnight bicycle trip. The lake is surrounded by tasteful, immaculately appointed hotels. All of them were suddenly shut down in 2015 in a pollution crackdown, dashing the dreams of hundreds of newly minted Dalifornians. Recently, however, some of these attractive small hotels are re-opening. The Cang mountain range offers many opportunities for hiking. You can’t lose by taking a cable car to the top of the mountain. It features a nature exhibition center run by volunteers from around China and the world. For some local flavor, take a bus or car to Xiayincun, seven kilometers north of Renmin Street on Highway 214, and take a stroll through this traditional Bai village, where the women still wear their traditional outfits while farming in the fields, and the old men sit in the village squares in their blue Mao-era suits smoking and soaking up the sun. The big new concrete three-story homes belong to the villagers. The old wooden courtyard homes, until recently used by the villagers as barns and storage areas, have been snatched up by Chinese from big cities and renovated into dream homes. Many moved here to educate their young children in a natural environment, outside the traditional school system. For a peek into this lifestyle, couchsurfing or getting an Airbnb in the villages from Xiayincun to Panchun is an excellent option. Several foreigners are operating well regarded private kitchens, which require advance booking. There are several access points to a network of trails that weave through the tea farms on the side of the mountain. Novice hikers can take a wide trail to a small tea processing factory, where you can buy freshly processed leaves. Experienced hikers who start at the break of day can climb to the Black Dragon Pool. Don’t stray off the marked paths, or you could be one of Cang mountain’s regular fatalities. For those who like to relax – or take their work with them – digital nomads and coffee fans are in for a treat. The west end of Renmin Street just downhill from Highway 214 feature Bakery 88, noted for its homemade German pastries, and the Bird Cafe, which roasts its own local Yunnanese coffee. The Elephant Cafe is a favorite with Chinese bohemians, and Serendipity Cafe is an exact recreation of an American diner, down to the apple pie and the bell that rings when meals are ready. 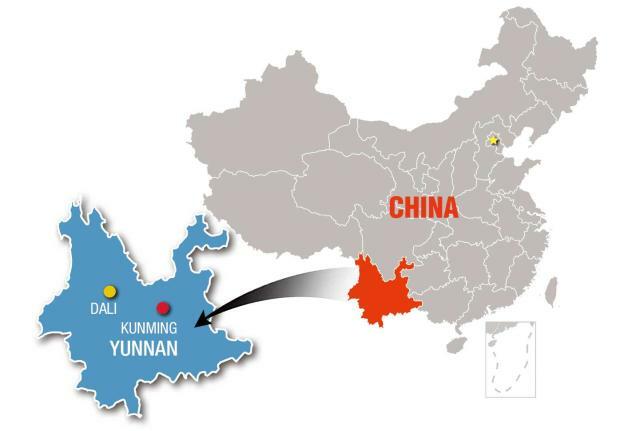 Of course, Yunnan is also famous for its own cuisine which features fresh vegetables and herbs, only found in the area, goat cheese, mushrooms and also a bit of spice.